MainAll NewsInside IsraelWill Supreme Court petition end discrimination on Temple Mount? Will Supreme Court petition end discrimination on Temple Mount? Civil rights group demands end to restrictions aimed at Jewish visitors to Temple Mount. Court gives state 60 days to respond. An Israeli civil rights group dedicated to combatting discriminatory policies on the Temple Mount has filed a petition with the Supreme Court, demanding that non-Muslims be granted the right to pray on the holy site. 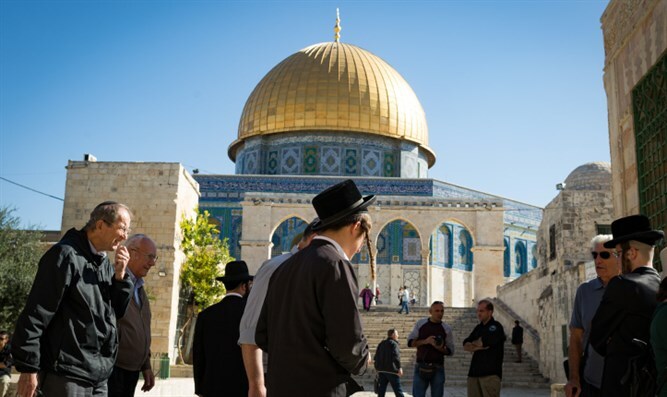 While Israel gained control over eastern Jerusalem in June 1967 – and with it the Old City and the Temple Mount – the government permitted the Waqf, a Jordanian Islamic trust, to continue to administer the holy site. For decades, the Waqf has numerous restrictions on non-Muslim visitors to the Mount, barring from entering some areas of the holy site, as well as prohibiting visitors from praying or carrying non-Muslim religious items. Israeli police have enforced the Waqf’s regulations, removing – and at times arresting Jewish visitors to the Mount for praying, prostrating themselves, or engaging in any other religious activities. But the Moked: Israeli Center for Advancing Democracy and Protecting Human Rights, a group dedicated to promoting legal equality on the Mount, recently filed a petition with the Supreme Court to challenge the State of Israel’s support for restrictions on non-Muslims at the holy site. The petition was filed last week by attorney Eitan Finkelstein against Israel Police, police chief Roni Alsheich, Internal Security Minister Gilad Erdan (Likud), Justice Minister Ayelet Shaked (Jewish Home), Minister of Religion David Azoulay (Shas), and Attorney General Avichai Mandelblit. In the petition, Finkelstein charged that the police department, while being charged with keeping the peace, has used its authority to maintain an explicitly discriminatory system, one which violates the freedom of worship. While law enforcement authorities, Finkelstein argues, are empowered to take temporary action restricting rights of some citizens for immediate security needs, the prohibitions on non-Muslim visitors to the Temple Mount are permanent, and have been in place for decades. The Supreme Court accepted Moked’s petition, and Justice Neal Hendel has ordered the State to issue a formal response justifying its policy within 60 days. In the past, the Supreme Court has ruled that the freedom of worship extends to Jews visiting the Temple Mount. A 2015 ruling rejected a two-year ban imposed by the police on Temple Mount activist Yehuda Glick, who became an MK for the Likud a year later. Despite the ruling, which appeared to affirm the right of non-Muslims to pray on the Mount, no changes were made to police policy on the Temple Mount, and no directives made by the court to the State to alter its policy.